The pARTners exhibit will be on display at Studios on the Park in Paso Robles through Feb. 24. In conjunction with the show, Art After Dark will take place on Feb. 2 from 6 to 9 p.m., and art historian Tess Wright will also present an art talk, Love and Work, on Feb. 9 at 3 p.m. For more information, visit studiosonthepark.org. 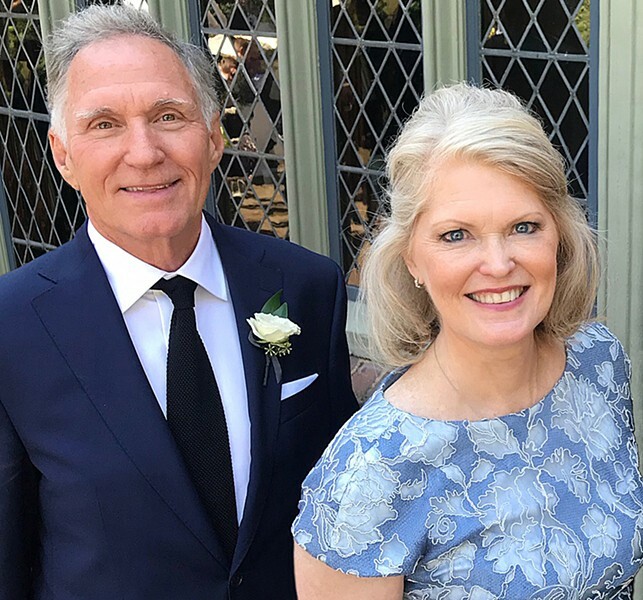 When the now Paso Robles-based Stephanie and Ken Wilbanks married years ago, they planned to be partners in life, but not necessarily in business or art. That changed after the arrival of their second child, when life seemed too chaotic for Stephanie to return to her full-time resort marketing job. Instead, she started working with Ken at his advertising firm. And about seven years ago, the retired pair moved to California to be closer to their kids and shift their focus to art. PARTNERS Artists and partners Stephanie and Ken Wilbanks work separately on their creative endeavors but give one another feedback during the process. The Wilbankses' work, along with the pieces of 19 other artistic California couples, is currently on display at Studios on the Park as part of the pARTners show, which explores the ways creative partners interact, inspire, and enhance each other's creative process. "I had this idea of creative couples where they're both artists in their own right," said Stephanie, who is also the show's curator. "When a piece is done or almost done, I trust his [Ken's] opinion." Stephanie said very few of the featured artist couples collaborate directly on pieces together, but most will provide one another with feedback during the art-making process. "We'll have an interim conversation, and he'll see right away the very subtle changes that are needed," she said. "It's something only another artist would see." REFLECTIVE Scarlet Ways, by Stephanie Wilbanks, is a kiln-formed art glass piece. Her work focuses on color and light. For his part, Ken said that it's helpful to have someone to tell him when enough is enough. "Most artists overwork their art," Ken said. "It's nice to have someone come by and say, 'You're done.'" While Stephanie creates kiln-fired glass art pieces, Ken makes wood sculptures. When relocating to California, the couple focused on finding a home with enough space for two studios. Stephanie describes her work as "contemporary and textured." 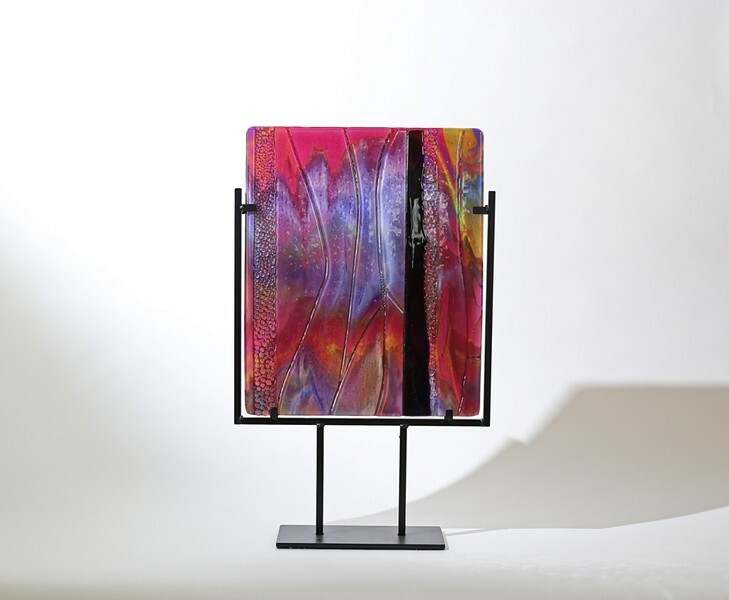 Her focus is on color and light when making pieces like Scarlet Ways, a beautiful glass slab with magenta, purple, orange, blue, and black hues affixed to a metal stand. "Because I work with glass, I'm always looking for color and light," Stephanie said. "How can I apply what appeals to me about that other piece, to glass? I like rougher edges, not so round and perfect." BASICS Wood sculptor Ken Wilbanks creates many of his pieces with birch plywood, a material commonly used in construction projects. 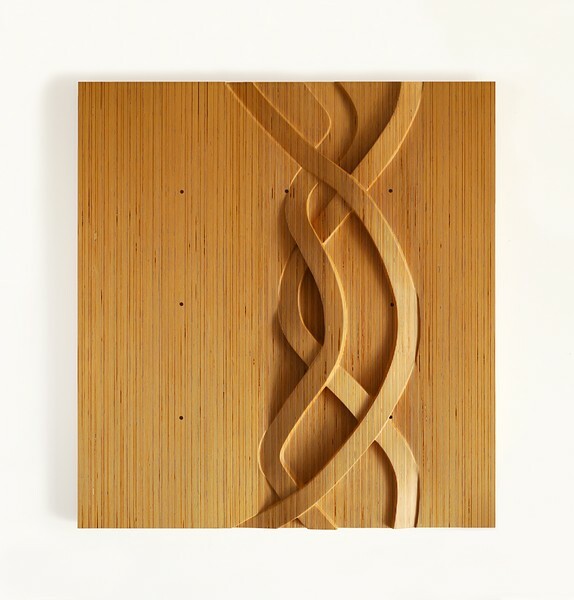 Ken often takes inspiration from working with ordinary building materials, such as birch plywood, and turning them into "organic abstract sculptures," in pieces such as Freeway Ply, which features an intricate wooden spiral design set on a birch plywood background. "What excites me is the humble construction tools I use," Ken said. "If you laminate it together and shape it, it becomes very interesting." Ultimately, the Wilbankses both hope that the Partners show inspires viewers to perhaps create art themselves. Arts Writer Ryah Cooley's partner edits her writing, sometimes. Contact her at rcooley@newtimesslo.com.